Horror Hits | Vault Of Evil: Brit Horror Pulp Plus! gloompunk; glitter goth: disciple of Rikki Nadir: demonik in disguise, etc. Some people prefer the Downliner Sect's cover on their Sing Sick Songs ep, but from what I remember, it's nowhere near as good fun. If only Screaming Lord Sutch had come up with it, he might have had that elusive hit! Well - I went to Norwich today, bought Super Aleste for the Snes (my holy grail of computer games) and then I went into the record shop and found this and it cost me a small fortune (! ), but I thought it was worth it - and thanks for introducing me to quite possibly the best song in the world. Click on the image and it gets bigger. If anyone wants a scan of it - give me a shout!! I hope someone out there likes the cover!!! Illustration: Mary Lewis. Sleeve design: John Constable Design Co.
Cringe along with us and listen to some of the most tasteless sounds around. Pain can be fun. Jess Conrad - Why Am I Living? So frustrating! I only have this on vinyl (hence half a cover scan: couldn't fit it all in. Not that it matters much as you can see) and have no means of playing it just now. Fortunately - or otherwise - the majority of these are so laugh-out-loud tasteless/ weedy/ inane/ dull (delete as applicable although in some cases it's unnecessary) as to be impossible to forget. There are exceptions - everything by Jess Conrad - but the real stars of the show are the death discs. We've swooned over the Jimmy Cross classic already but, if one thing's for sure, Jimmy was intentionally sending up the morbid genre. Can the same truly be said of Ferlin Huskey and his cautionary tale of the Drunken Driver who splattered a child across the highway? What of Pat Campbell and the bargain he made with God in the maternity ward when it looked like missus and child were gonna stiff? Dickie Lee gives us a ghost story built around the enduring urban legend of the good samaritan who gives a pretty stranger a lift home at night. Where do you live, love? Oh, the cemetery. At least he gets his sweater back. Meanwhile, back out on the road, Nervous Norvis is justly celebrated for his dangerous driving in Transfusion while the Legendary Stardust Cowboy gives good dementia in the still ahead of its time Paralysed. Don't know what The Trashmen's raucous Surfin' Bird is doing here but no arguments about the inclusion of the deliciously abominable Wunderbar. It's virtually impossible to choose between Jess Conrad's unprecedented three top twenty entries though for sheer existentialist angst, even Robert Smith would have been proud to come up with Why am I living?. This Pullover is just .... impossible! And yes, that is the very same, mawkish I'm Going to Spain as covered - faithfully - by .... The Fall! If you can ever get that album onto cassette - I would love a copy Glam! It looks amazing! I'm sure I remember this being featured on Tiswas, where they played the Eamonn Andrews track. Neither The Trashmen's 'Surfin' Bird' or 'Paralysed' by The Legendary Stardust Cowboy have any place being on a world's worst record comp! 'Surfin' Bird' (covered by The Ramones and The Cramps among others) is a certifiable classic and "The Ledge" is clearly just deeply misunderstood. Another great "worst" we shouldn't overlook is William Shatner's extraordinary The Transformed Man album featuring his somewhat overwrought interpretations of Hey, Mr. Tamborine Man and Lucy In The Sky With Diamonds. 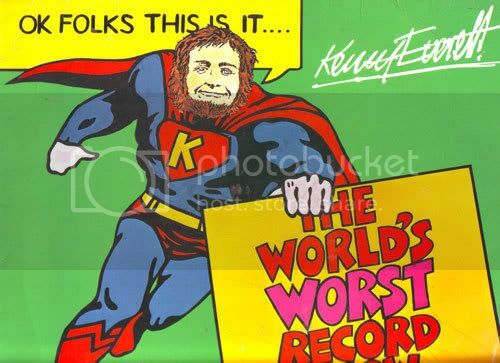 As my alter-ego mentioned, you might like to try this excellent site, Kenny Everett's The World's Worst Wireless Show where you can hear all the original shows featuring several "worst"'s (including the stomping majesty of Mechanical Man) that somehow failed to make the cut. Keep it real, pop pickers. Is that a cover of the Leon Payne Psycho ("Aw, don't hand my Johnny's pup, momma, for I might squeeze him to die ....", etc.)? Lovely record! The Nim's Bilbo Baggins featured in one of those Top 10 Pop's Most Embarrassing Moment thingies on C4 or 5 as recently as this weekend gone. I can't really tell you much more about it, I'm afraid. Like any other right-thinking gentlemen, I switched off in protest when it became apparent that the sublime Pans People were to be held up to ridicule over the notorious The Monster Mash routine. Meanwhile, here's Kenny Everett (He's the one you look at second). I was privileged to hear by chance a live broadcast (in the sixties from one of the North Sea Pirate Stations) of Kenney Everett being trained by Tony Windsor (Tony Withers) in how to be a DJ. Probably KE's first ever public broadcast. As far as The Shatner goes - nothing can ever come close to his rendition of Elton John's Rocket Man. Enjoy and maybe cringe a little. They're different songs, Dem, er Glam. Isn't it too tight rather than to die? Did anyone go and see the Sonics when they came over recently?